Bridging the gap between minimalist themes built for mass appeal and fully textured and colorful themes built for clients. Ravel looks good out of the box. Designed by Tung Do (@tungdo), one of WordPress’ top designers, Ravel is a theme for people who want a little personality with their blog, portfolio, or professional profile site. Introduce yourself with the Intro template. Ravel comes with a custom page template for introducing yourself. Use it to show off a little of your work or just put some pretty pictures up. It works great on the front page! Ravel fully integrates with the Custom Content Portfolio plugin, which allows you to manage your design, photography, or other types of artwork. Images and videos are the currently-supported media types. Includes a custom tabs widget. The theme comes with a custom tabs widget for use in your sidebar. This widget was specifically designed for showing recent posts, popular posts, recent comments, and post tags. Customize your brand in the theme customizer. 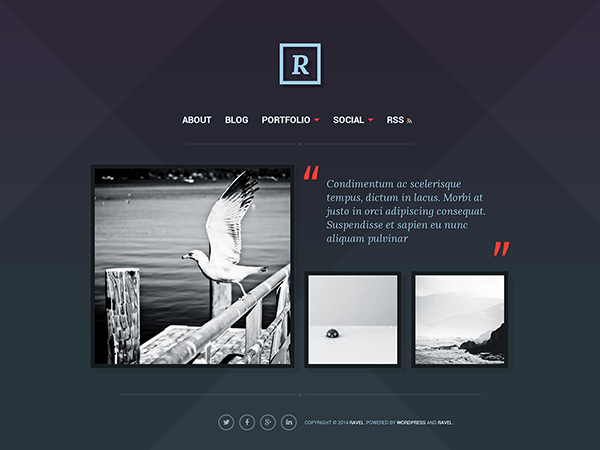 Ravel allows you to choose between a custom image or text for your header. If using text, you can also select to show just a boxed, single letter. Link up your social profiles. You can use links to your social networking profiles in your nav menus. Put them in your main menu to have them front and center or drop them in the footer for a different look.